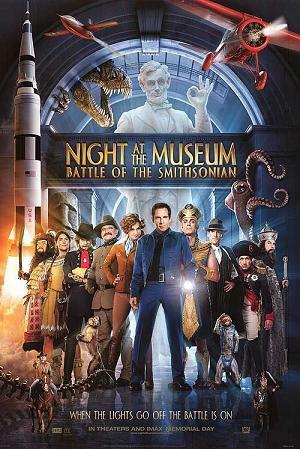 Night at the Museum: Battle of the Smithsonian (known outside of North America as Night at the Museum 2), is a 2009 American comedy film and the sequel to the 2006 adventure comedy film Night at the Museum. The film stars Ben Stiller, Amy Adams, Owen Wilson, Hank Azaria, Christopher Guest, Alain Chabat, Steve Coogan, Ricky Gervais, Bill Hader, Jon Bernthal, Patrick Gallagher, Jake Cherry, Jonah Hill, Rami Malek, Mizuo Peck, and Robin Williams. It was released in theaters on May 22, 2009, and is rated PG for mild action and brief language. The Jonas Brothers made their big screen feature debut as the voices of the Cherubs in 2009's Night at the Museum: Battle of the Smithsonian. They will next appear in Walter the Farting Dog; an adaptation of the bestselling series of the same name written by William Kotzwinkle and Glenn Murray. It will be a family film starring the four brothers.